what the differnce of an AMD64 vs an AMD operton, this is just for curiosity. I'm sure someone knows the difference don't make me beg. Depends which A64 your talking about; the new 939 opterons are San Diego and Venus Cores which feature 1MB of L2 cache and as far as i can tell the achitecture of the chips is the same as the San diego based A64, i would assume that the only differance is that the Opteron is better quality as its designed to be used in servers where reliablity is paramount. From what ive seen the opteron is a better overclocker than the San Diego and Venice Core A64s... some are hitting 3Ghz. Hope this helps. 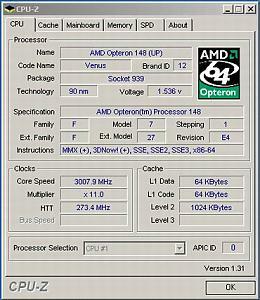 Looking at ~$400 AMD 64x2 as well as ~$400 Opteron CPU's, the 64x2 runs 200 Mhz faster than its Opteron sibling. However, the Opteron sports 2 1 Mb L2 caches-- instead of the 64x2's 2 512 Kb L2 caches. Some folks say that larger L2 caches don't mean much. Personally, the dual core Opteron's 2 1Mb L2's sound better than the Athlon 64x2's dual 512 Kb's do. Depends on the given application whether 512kb or 1024kb L2 is better. I've noticed no difference in running either, performance wise, so it's probably down to less than 5%. The 1024kb cores tend to go farther in mhz than the 512kb...even direct from AMD, the 512kb is 2.4ghz max, while the 1024kb is 2.8. maybe a leakage issue with the crossbar hidden in there...and why the 3.0ghz A64 isn't a likelyhood. Last edited by cadaveca; 4th December, 2005 at 09:15 PM. From memory, Opterons are designed to be able to drive eight memory banks, whereas Athlon 64 chips are designed to be able to drive four memory banks. In current terms, that means that an Opteron can directly handle 16GiB of RAM, whereas the Athlon 64 is limited to 8GiB RAM, assuming that the Athlon 64 can succesfully drive 2GiB DIMMs. atm Power Now does not work on S939, but does CNQ work at 300MHz+ htt? Oh, I'll need that 16 Gb capability when I build a dual-core Opteron machine next year. For Web crawling and running Word, you must have the power! Also, Opterons that are not 939 require ECC registered memory. Mainly their purpose was for CAD, graphic design, servers..workstations etc. Also, I know A64's handle four memory banks, but I thought there were some troubles with the memory controller acting up...or falling back to a 2t command line?---or is that just rumor? thanks acctuly I might be building a PC for someone and I think I might go with an opteron. better act fast on the opterons. AMD is no longer shipping them to retailers. They will now only ship to server manufactures. There will be no fresh supply of them starting in 2006, so get them while you can! I'm loving my 144. Awesome overclocker for $150 (running at a 40% OC on stock everything). I'm going to attempt to convince my parents. I doubt they'll let me. I think i'll be getting a 146 in a few weeks. i am trying to decide between an x2 3800+ or the opteron 146. what are the advantages of the two, and which one is better?? Im looking o overclock, and I do alot of gaming. Thanks! Ordered a 148, it's in the mail. . . Hoping for 2.8 ghz. Just got my 148 2900 mhz at 1.55 vcore. 3008 mhz at 1.65v but not stabel.